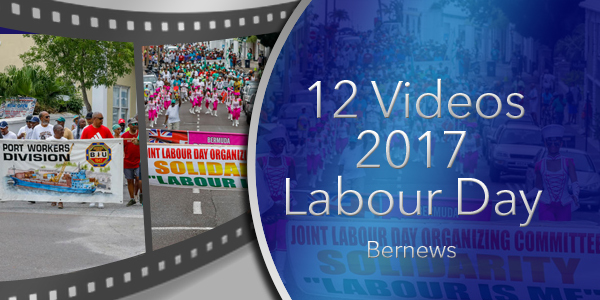 The island celebrated Labour Day this past weekend, with a banquet and road race, as well as a gathering and march through Hamilton. Following the banquet on Friday evening, people gathered at Union Square yesterday [Sept 4] to hear various union leaders addressing the gathered crowd before the march took place. Reverend Nicholas Tweed started off with a prayer, and those delivering remarks included Premier David Burt, Home Affairs Minister Walton Brown, BIU President Chris Furbert, BPSU and BTUC President Sen. Jason Hayward, Teachers Union President Shannon James, and Entertainers Union President Leroy Simmons. The day began with the annual Labour Day road race in the morning, which saw Lamont Marshall finish first with a time of 16.34, Tim Price placing second at 17.31, Sean Trott finishing third with a time of 18.22, Omari Hart finishing fourth at 18.48, and Dennis Mbelenzi rounding out the top five by crossing the line in 18.57. Gayle Lindsay was the first female finisher and seventh runner to cross the line in 19:56, Martina Olcheski-Bell was the second female finisher and ninth overall by clocking 20:43, and Hilary Haldeman was the third female finisher and 16th overall with a time of 21:48.